#TheShow moves the chains on third down. Great catch by Bowe. DB was all over him (and flagged for it). 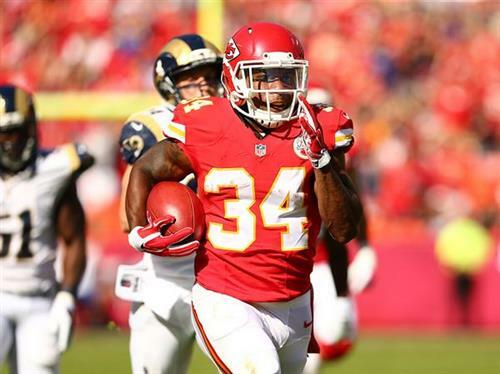 Bowe gets back to back receptions of 14 & 10 yards as #Chiefs have 1st and 10 from the #Rams 25-yard line. Tied 7-7 at 2-minute warning. The Internet tells me Alex Smith has thrown one incompletion today (14 of 15). That incompletion was a Travis Kelce drop. Ron Parker is having a hell of a day. Phillip Gaines receiving attention on field, then walks off on his own power. Chiefs already down Jamell Fleming, who left with a hamstring. Chiefs still have Ron Parker and Marcus Cooper at CB. They were actually first teamers in camp. 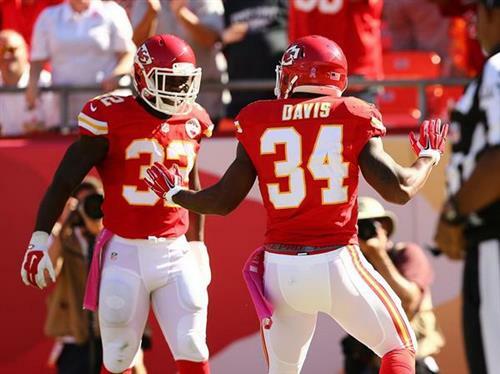 Knile Davis' 99-yard kickoff return TD was the second of his career. 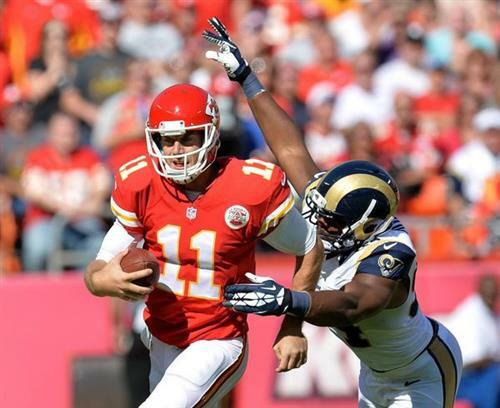 Robert Quinn is owning Fisher right now. He’s not the first or last LT to get owned by Quinn. That penalty helps the Chiefs but that's a bad call. Alex slid head first. 3rd & 13 leads to an Alex Smith scramble for 1st down. Then a "spearing" (cheating) penalty adds another 15. HUGE swing for the good guys! Arrowhead already advertising One Direction show on its video boards. Gonna be a long season, you guys. #Chiefs QB Alex Smith showing some maneuverability inside pocket on that seam to Charles. Pressure allowing his athleticism to be displayed. Alex is 17/19 for 119 yards. This is probably Andy Reid's favorite game of the season. Chiefs at the 14-yard line. First down. Leading 17-7. Last week the unsung hero was #Chiefs LB Josh Mauga. So far today it looks to be Ron Parker. Interception & a sack already. Huge. Guy with the "Buck the Froncos" shirt getting high fives on his way up the stairs. Santos boots it in for 3 more. Chiefs lead 20-7 with 8:46 left in the third. 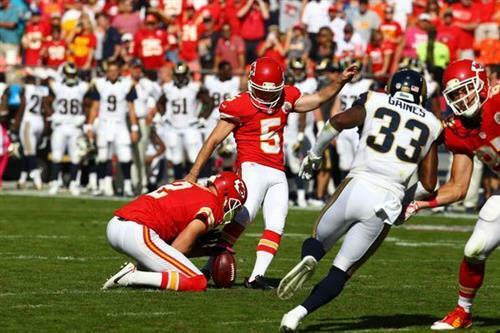 Cairo Santos hits from 28 yards. 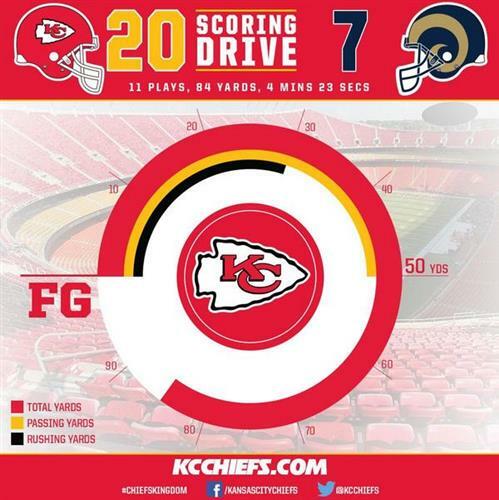 #Chiefs take 20-7 lead over the #Rams . Dustin Colquitt was a nice save on the hold. I hear he can do the splits, too. That 28-yard field goal makes 8 consecutive makes for Santos.